Our Soap Filled Scourer Pads are a practical and effective addition to your kitchen environment. Each one has been manufactured from a very strong wire wool with concentrated detergent impregnated within. When combined with water, they create a highly effective cleaning option for removing items such as baked-on foods. They are also ideal for cleaning aluminium and removing rust stains from other items with a hardwearing design the ensures long-lasting service. 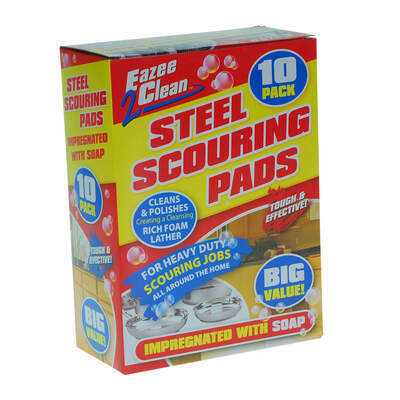 This pack of 10 scourer pads are supplied in a resealable bag for easy storage. Here at Gompels, we have everything you need for effective washing up. From our Dish Brush through to Tea Towels, you'll discover exceptional wholesale prices when you shop online with us.